We will paste the cook hat symbols on top of your review. A red pepper will be added if it is a spicy place. Also handy, if you send a review, describe the location of the restaurant. Pictures of the dish, restaurant etc. would be great too! I recently visited Sanchon restaurant again and there have been some small changes which I like to write down. First of all I have to say that the food is still delicious and still too much, so nothing about that. But they have now also "normal tables and chairs" available for those who do not like to sit on the floor. Personaly I think it was not necessary to do that but I can imagine that some foreign guests prefer a normal size table. Another change is the tea house. Before Sanchon was only a restaurant but now you can also come in for a nice cup of tea. The tea house is attached to the restaurant and they have a small area where you can buy gifts. The menu has been changed a little, instead of 16 dishes for a full course lunch you will get now 20 dishes, including tea and sticky rice pastry. The price for this full course lunch is KRW 19.800 and although it sounds much I really think it is worth it. My neighbour went last week for diner and she told me there was a nice Korean Traditional Art performance which is done every evening of the week. 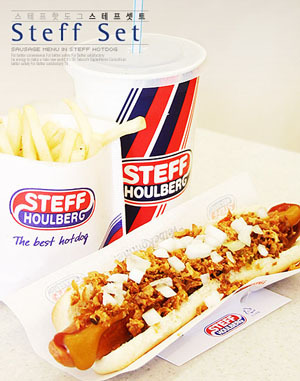 The outlets of the Steff Hotdog chain are widespread in South Korea. I have tried some of their hotdogs at several occassions. They are normal hot dogs, nothings special but I guess ok if you need fast food. So normally I would not have written anything about Steff and his hotdogs. But something happened last night that triggered me to write about Steff hotdogs. It's the same thing that made me angry at Kraze Burgers. It's a stupid habit and it seems to spread throughout Korean fast food restaurants. They cut my hotdog in half! That bloody ************* employee cut my hotdog with scissors!! What is it about Korea that habits spread with the speed of light and even worse, that at a certain moment everyone pressumes that it is normal. Why can I not choose myself how I want to have something served? I believe hotdogs should be long and being served on a long bun, why did they make them long in the first place? They could have made shorter buns or sausages if it would be normal to serve them like that. And why do I get so angry about things like this? I think many people here act like lemmings in a group. Once an habit secretly has been adopted (I guess by the supreme commander of the secret order of Ajima's) everyone is supposed to follow it or at least like it. For some time now I wondered why at least one of the outlets of Kraze Burgers is populair. In the Coex shopping mall you see people line up outside during weekends. They even draw lines on the floor where you should stand and wait for your burger. Recently they opened a new outlet near Gwanghwamun and last week I finally tried one of their burgers during my lunch break. I am still shocked, why??. The taste is ok, better than an average McDonalds burger because of the structure and size of that pile of meat between the buns. But the price, more than 9000 won with tax for a simple burger without anything extra besides home made pickles, 9 dollars because they add these pickles?. A crazy price for a Kraze burger! But I am even more shocked because of something else. They cut the burger in half without asking me and I just simply hate it. At random I also get these mutilated burgers at the Burger King in Korea. It is a complete lack of customer orientation. After one customer satisfaction survey some people probably complained that the burger was too big for their mouth. Now I am still suffering because in fact their mouth was big enough, they just secretly wanted to share the burger to save on the costs but they did not dare to tell the truth in that survey, hahaha. The name Top Cloud doesn't mean that they burn your steak, this luxurious restaurant is magnificient located in the Chongro Tower Building. 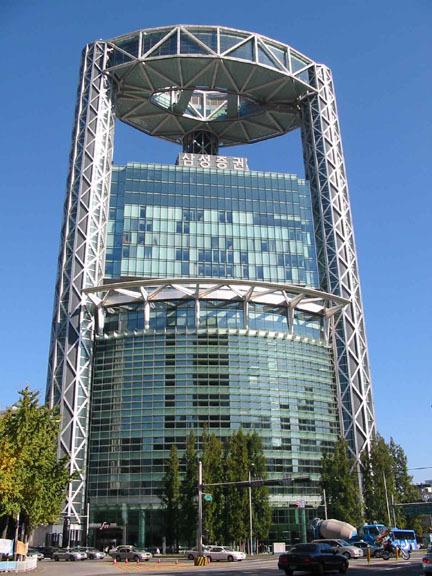 If you have ever visited Seoul you probably know this tower, it's the tower with the three 'legs'. On top of these legs you have a construction almost floating in the air which is indeed Top Cloud Grill Bar. Top Cloud belongs to The Shilla Seoul. This hotel is a 5 star hotel, food served in Top Cloud is partly preparated in the Shilla Seoul. They call it fusion food but to us it looked like French cuisine. We visited Top Cloud with one guest. Reserve a table at a window to enjoy both food and a great view of downtown Seoul. Making a reservation is easy because both management and waiters speak English. Two of us ordered a proposed menu with 2 choices for appetizer, one soup, 3 choices for the main course, 2 choices for desert and coffee or tea. Christina ordered a la carte filet mignon, creamed spinach and tea. We chose fried soft shell crab for appetizer, the soup was some kind of creamy potato soup. For the main course we had grilled lamb and filet mignon. For desert we had chocolate bread crumb pudding cake. We also ordered a bottle of Baron Rotchild Bordeaux 2002. The shell crab was perfect fried and seasoned. The soup needed a little bit extra pepper. Both filet mignon and lamb were perfect medium roasted as ordered. The spinach was creamy but with a little bit too much garlic. The bread crumb pudding cake was nice and sweet, and very nice decorated with a piece of white chocolate. It was covered with some kind of cranberry sauce to make it more juicy. In short, a very good diner with a very nice wine. Dining is not only about eating but about ambiance which you will certainly find in Top Cloud. Of course we had 'live' background music, jazz but not noisy and well performed. The only disadvantage is a suffering credit card. Dining in Top Cloud is expensive. We paid KRW 75.000 p/p for the proposed menu, KRW 45.000 for filet mignon, creamed spinach for KRW 8.000, tea KRW 7.500!! and the wine was another KRW 70.000. These prices are subjected to 10% service charge and 10% tax. Still we certainly recommend this restaurant if you have some money to spend for a nice evening. 33 fl. Chongro Tower Bldg.6, Chongro-2 ga, Chongro-gu, Seoul. Last week I had a farewell lunch at Arvorig and it was really a nice experience. They have all kinds of "crepes" and "galettes". The galettes are made from buckwheat and have hearty things on it like meat, vegetables, cheese and seafood. I tried the thinner flour crepes which are served as a dessert, but they are also fine as a sweet lunch. I tried the "pirate" with banana and chocolate on it which was set on fire with rum after serving. It was really heaven on earth! Together with a crepe goes "cider", a slight alcoholic apple drink, and of course I tried that too. Everyone can feel at home at Arvorig because it has colorful walls with family pictures on it. Seated on big leather seats you can have lunch or diner with two or three people and the wooden tables with matching chairs are suitable for large groups or families. The wine bar at Arvorig is located at the first floor and you can choose from many good wines. The wine of the house is also recommendable. The prices at Arvorig are very reasonable, which means that my crepe de luxe was about 8.000 won, the price of the galettes are a little bit higher. The apple cider? I have no idea, but probably also not that expensive. Arvorig is located in an alley behind the Hamilton Hotel. For people like me (living for three years in Seoul and still not knowing everything in Itaewon) it is located on the Hamilton side of the street in the alley opposite of the fire station. For large groups it is best to make a reservation 02-7951534. Like in many other asian countries, South Korea also has its food streets. The following streets have only one special dish like "hot, spicy rice cake", "boiled pig's feet" etc. after which the street is named. Pimatgol back alley street (Jitze always eats here). You can choose which restaurant you want to visit but do not expect boiled pig's feet in the "Korean sausage" street. Also the quality may vary from restaurant to restaurant. But I think it is worthwhile to visit one of the streets if you are looking for a particular dish. Have a nice meal! This restaurant is located only five minutes walking (two streets) from the US Embassy at Gwangwhamun. 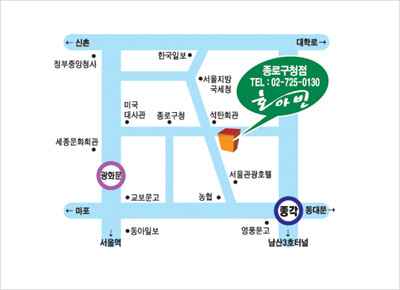 On the map below, you see Gwangwhamun (station 533) in purple and jonggak (station 131) in blue, Telephone: 02-7250130. In front of the restaurant, they put some artificial bamboo trees so it is easy to recognize. The restaurant itself has one dining room, which looks clean and neat with good chairs. It is popular. Sometimes you have to wait shortly for a table. 'Hoabinh' means 'vase' in Vietnamese. We serve noodles in a bowl for you with our whole heart just as you put flowers in a vase for your guest. 'Pho' is the most important dish. This is Vietnamese style noodle soup. Two of my colleagues and I had lunch there and we tried several different types of 'Pho'. We had fried egg roll as a starter, 'Pho' with tenderloin, 'Pho' with seafood and mild Fried 'Pho'. In fact, we wanted the chicken version, which is new, but I think it is too new. They did not have it today. The ordered egg rolls were fried perfect, light brown. Together with a sweet and sour sauce, the taste was delicious. The main dish also did not disappoint us. The taste of the bouillon is just right, this means slightly salt. The noodles are not handmade but cooked exactly long enough. They have a bite and are not sticky. The vegetables are fresh; you should try adding the raw bean sprouts in your bowl of noodles to make the dish crispy. We all agreed that it was a good 'value for money' meal. For 27.200 won (approximately 25 usd) we settled our debt for 3 persons. In fact, we did not have any complaints. If you do not want to eat Korean food every day, look for one of the HoaBinh restaurants in your neighborhood. If they are as good as this one, you will not be disappointed. The only thing you have to take in consideration is that HoaBinh does not provide you with an evening filling dining experience. These restaurants are for lunch audience, not for dining several hours. This restaurant is located behind the Kyobo building at Gwangwhamun. Look at the back of Kyobo building and you will see a burger king at the beginning of a small street. About 50 meters from that burger king is a small alley. Walk 20 meters into this alley to find it. The address is: 267 Chunjin-Dong, Jongno-Gu, Seoul, telephone: 02-7329559, mobile: 016-3433337. The restaurant itself has several rooms for groups up to 25 people. No chairs, you have to sit on the ground. The rooms are more or less located around a central open area. It looks a little bit shabby but it is clean. Yicho is popular among Korean people because the Korean barbecue is quite good. More important, they serve a wide variety of side dishes, appreciated by my Korean colleagues for taste and quality. Try the egg cake, the mixed fruit salad and the squid. Their specialty is Korean barbecue and as usual it is prepared on heaters in the middle of the table. The waiters are generous with refilling empty side dish plates (free). The quality of any Korean barbecue meal depends on two things. Side dishes and the meat you choose for your barbecue. I would recommend beef although this is more expensive than pork. It is juicy, tender, and salted just the right way. The weak points of Yicho: If you want to have a great dining experience, you need beef, which is expensive. With several drinks and a cinnamon tea, I paid 40.000 won for the whole experience. This restaurant is certainly worth paying a visit, but it should have been 10.000 won cheaper for what you get. Sanchon (Mountain Village) offers a variety of selections using fresh vegetables found and grown in the mountains and woods throughout Korea. The dishes have been inspired by temple cooking which the proprietor, Mr. Kim Yon Shik, came to know during his years as a Buddhist monk. While no longer a monk, Mr. Kim remains a master of vegetarian cuisine, varying selections each day according to which vegetables are in season, available and of top quality. Selections such as the "table d' hote choices" the vegetable sample and other items thus change from day to day, and from season to season. The vegetable dishes on the Sanchon menu are all naturally seasoned and no chemical additives are used. I had a Sanchon full course lunch consisted of 16 dishes and it was too much to eat all. A friend told me on forehand to bring a plastic box and I took some of the food home. It was a very nice lunch and I ate vegetables I never had before. The price of a full course lunch is 17.000 Won (VAT not included) but this lunch was an offer so I did not pay myself. If you want more information on this restaurant visit their website at www.sanchon.com. I found an interview with the owner of Sanchon Restaurant, always nice to read.